Breakfast is arguably the most important meal of the day. Especially if you´re arguing with a nutritionist. When I am travelling and especially when I am staying with friends abroad, I find that breakfast says a lot about the place I am in and the people I am with. The Full Irish – closely related to the Full English, this is the type of heart stopping affair that will safely keep you full ´till dinner. Handy if you´re labouring in the fields all day or as in my case, exploring the Irish countyside. The key elements include bacon, sausages, black pudding, white pudding, sautéed mushrooms, beans, fried potatoes and tomato. All cooked in lots of lovely Irish butter and served with soda bread and a cup of tea. My favourite parts were (vegetarians look away) the respective puddings; black pudding is a made from pork blood, oatmeal, pork fat, onions and spices and white pudding is similar minus the pork blood. 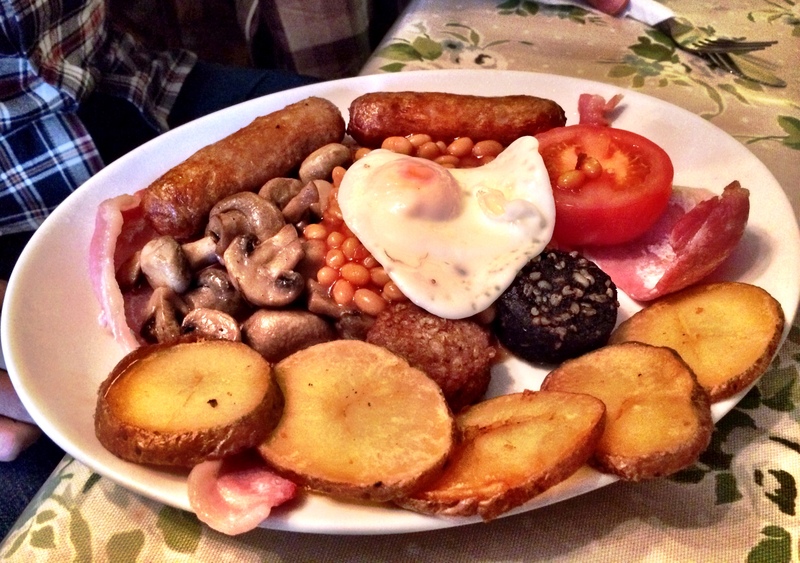 It´s the key defining feature of the full Irish breakfast so don’t let your squeamish side deter you! Not just any old breakfast pastry, Mallorca´s ensaïmada is a protected product (up there with Champagne and feta) with a guarantee of origin since 1996, even though it originates from the 17th century. Flour, water, sugar and pork lard create sheer layers of pastry which are shaped in a coil, baked, sprinkled with powdered sugar and sometimes filled with cream or custard. 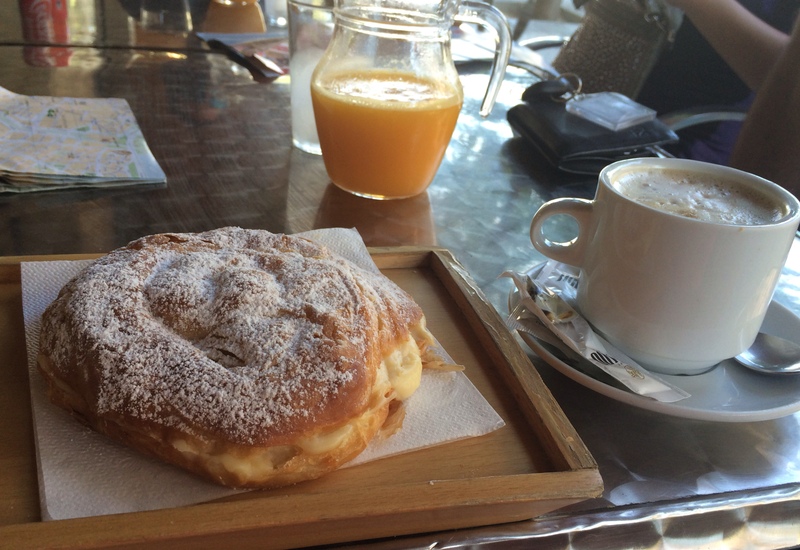 They are the Balearic answer to croissants, dipped in coffee and enjoyed as the morning meal. Breakfast spread in Leipzig. Where to start?! 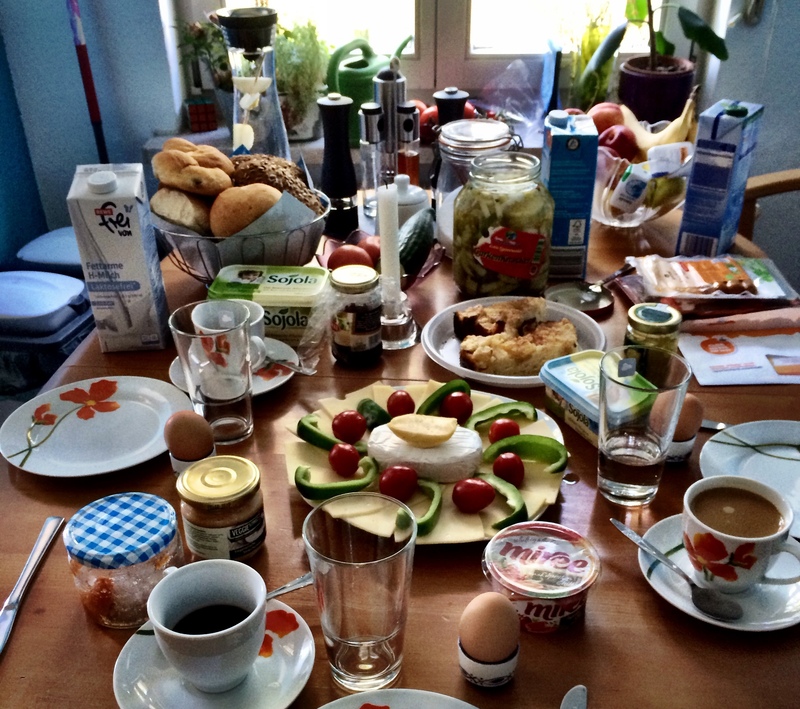 My friends Marc and Kathleen in Leipzig really know how to put on an impressive German breakfast spread. It all starts with bread; lots of it and different varieties. Select a piece and build your breakfast from there. There were several cheeses including camembert and cheddar, various cured meats (even a vegetarian sliced ´meat´), crudités, jams, mustards, hard boiled eggs, homemade pickles, cream cheese, slices of apple cake, fruit and fresh coffee. I tried to be as restrained as my hosts, focusing on one piece of bread and one or two toppings at a time but with that spread it was tough! 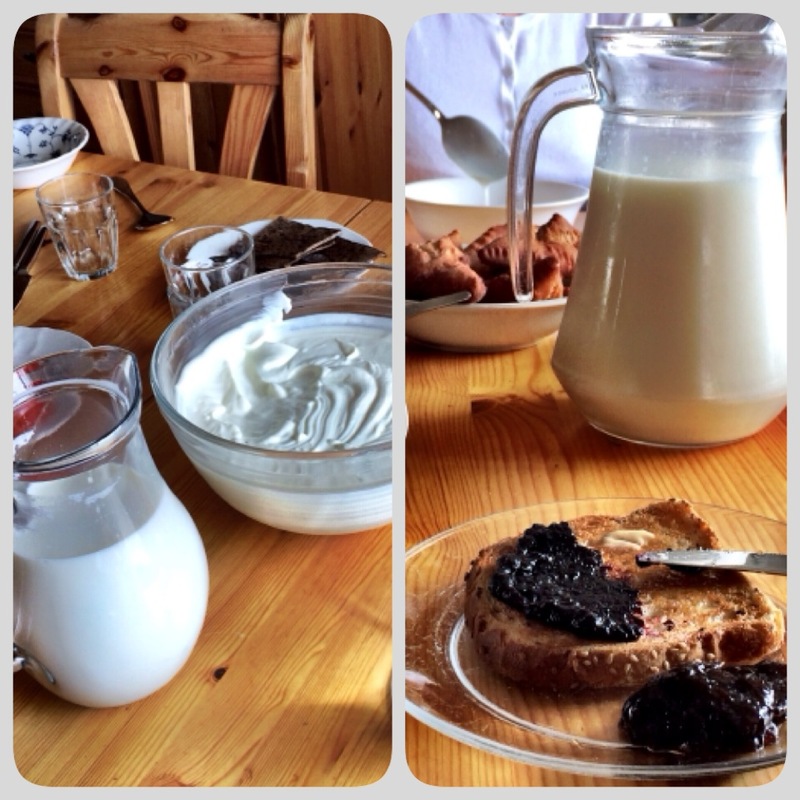 A homemade Icelandic breakfast is not to be missed. I´ve already waxed lyrical about my obsession with skyr and the fact that it appears at every meal. Breakfast is no exception. Add milk or cream or just enjoy this smooth dairy product unadorned. Almost everything at this breakfast table was homemade, including the sweet kleina pastries and the delicious blackberry jam. 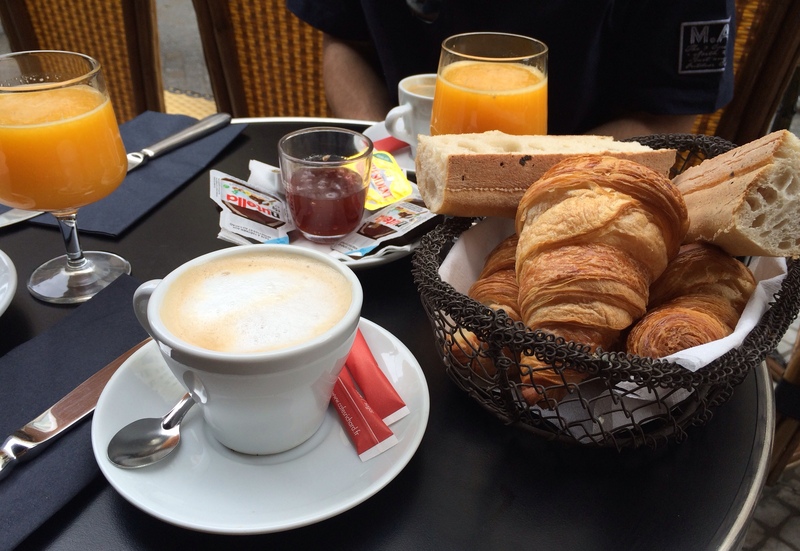 Breakfast at a sidewalk café in Paris is as de rigueur as visiting the Louvre. 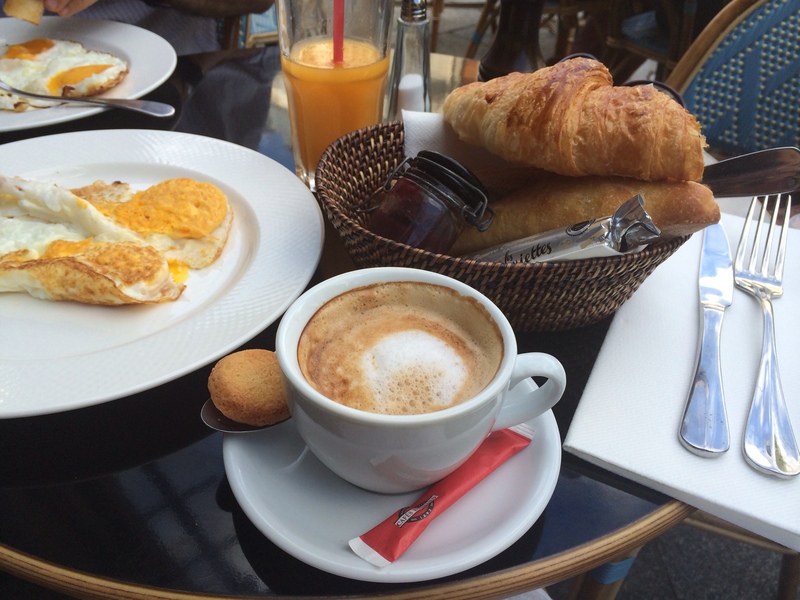 A French breakfast is usually small and perfectly formed – typically a croissant and/or tartine (sliced French bread) with butter and jam, juice and café crème. You can jazz it up with a fried egg or swap your croissant for a pain au raisin. Très chic, just like the French. What´s your favourite breakfast meal? I´m a terrible Aussie, i don´t care for vegemite at all! You have a point, I definitely couldn´t stomach sausages and the like every day. But while travelling I like to eat as the locals do. First and foremost for me though is good coffee, unfortunately not always easy to find when you are on the road. i must admit that i always struggle a little with spicy asian noodles for breakfast! Oh, how l love blood pudding in a fry up. But, my favourite breakfast of all (and it is my favourite meal of the day) is Eggs Benedict. Yummy. Eggs Benedict are fantastic and a brunch staple in Australia. I order them regularly at home but look for something more unusual when I travel!